The Hungarian linguist and ethnographer, Benedek Baráthosi Balogh visited the Far East (Japan, Sahalin, Amur region, Korea, Manchuria, China) on several study trips at the beginning of the 20th century. His linguistic and folklore collections are entirely unknown, partly because they remained in manuscript and partly because another portion of them was published only in Hungarian. When, in 1996, the Budapest Museum of Ethnography organised an exhibition of Baráthosi’s object collection, primarily the material collected in the Nanai and Ainu areas of the Amur region, 9 Nanai shaman songs (prayers) were also discovered in the archives. These are being published here in K. Köhalmi’s phonetic transcription, with T. D. Bulgakova’s commentary. Countless articles and not a few books have been written on the history of shamanism. Most, however, advance speculative hypotheses suggesting that shamanism had its origins at the very outset of mankind’s development with no explicit definition of who is considered to have been a shaman and who not. 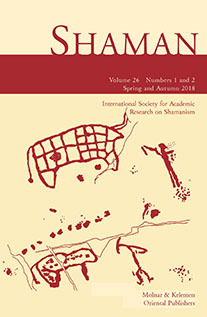 This paper therefore opens with a general definition of “shaman” and, in the light of this, reconsiders those Eurasian sources which report on persons who qualify as shamans. An overview shows that most Paleolithic rock carvings do not provide unambiguous evidence of shamanism, as Hoppál has claimed. Only a limited number of archaeological finds indicate that shamanism existed in Northern Asia and China 3,000 years B.C. or perhaps a little earlier. From mediaeval times onwards there are many written records of shamans, but these show that they were only one of many groups of religious specialists (as in present-day Korea) under the great empires. Only in small, scattered societies do shamans have such manifold tasks as the anthropological prototype of the shaman would indicate. Shamanism, then, has undergone many changes, not only in the present century but in earlier centuries as well. We should not conceive of it, in contradistinction to all other continuously changing cultural elements, as an immutable institution. Although most scholars discount the existence of an active shamanic tradition in mainstream Hellenic culture, an analysis of one of Sappho’s poems reveals Sappho to have been a trance practitioner. The key term in this regard is koma, central to a matrix of terms employed in Greek poetry to describe the experience of trance. Comparative analysis of passages from the Iliad, Odyssey, Theogony, and Pythian I, as well as the Biblical Song of Songs, uncovers a language of shamanic trance in which koma, the River Styx, paradisal gardens, wind and breath, metaphors for psychotropic substances, and key words such as kaluptein and pneuma, are among the key elements. Decoding this language provides insight into the history of shamanism, epic and poetic themes, poetic diction, and the transition from direct experiential modes of religion to more formal, mimetic institutional practices. The Saga of Eirik the Red describes a seeress, who sat in a specially prepared High Seat to foretell events for a Greenland community of 1000 years ago. She used a technique known as seidr, calling on “powers” to help her see further. Seidr magic was chiefly performed by women, with male practitioners disparaged as ergi. Today members of reconstructionist “heathen” communities in North America are drawing on such accounts in establishing seidr as shamanistic practice, involving trance or shapeshifting, for foretelling and healing. This article examines constructions and contestations of seidr within communities of past and present. For some time Roberte Hamayon and Ake Hultkrantz have aired their differing modes of approach to the current notions of what constitutes trance and ecstasy. This article endeavours to briefly sum up their respective positions, and then-by examples-to work beyond these in a demonstration of support for Hamayon’s use of symbolic representations to describe an elusive condition which-to my mind-cannot otherwise be described scientifically at present; that is given the suppositious terms anthropologists may be obliged to adopt in any attempt to directly describe these phenomena.